United States Ambassador to Nigeria Stuart Symington and his UK counterpart Ambassador Paul Arkwright have paid separate visits to the Chairman of Forte Oil Plc, Mr. Femi Otedola, during which the parties held discussions on the Nigerian economy and the role of businesses in the country in exploring partnerships with international businesses to create more job opportunities for Nigerian youths. 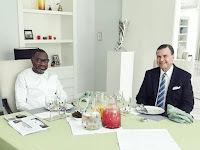 At the breakfast meeting with Otedola at his Ikoyi, Lagos residence, the U.S. ambassador commended the Nigerian energy magnate for his continuing investments in the country and for being a role model for other indigenous entrepreneurs. The American envoy drew Otedola's attention to Nigeria's growing population, noting that the private sector has a critical role to play in creating opportunities for youths to be gainfully employed and in nation building. This, Symington added, would help to address poverty in the country and rising insecurity due to the high rate of unemployment. He encouraged Otedola to explore partnerships with U.S. companies interested in investing in solar power projects and exports. Responding, Otedola, who in addition to being the majority shareholder in Forte Oil, is also an investor in the Geregu power plant in Ajaokuta, Kogi State and is expanding into solar power, thanked the U.S. ambassador for the visit and expressed his commitment to working with international businesses to expand his footprint in the country. "Nigerians are very entrepreneurial and would latch on to any opportunity to start and grow a business. The problem, however, has been access to cheap and long-term capital which remains an impediment. "That is where we would like the U.S. to come in by encouraging private equity firms, venture capitalists and using U.S. export guarantees, among others, to support Nigerian businesses to become competitive and make good returns on their investments," he said. He reminded Symington that despite the political and economic risks in the country, Nigeria remains one of the few countries in the world where the returns on investment are still high due to the infrastructure and technological gaps, making foreign investment a worthwhile venture. 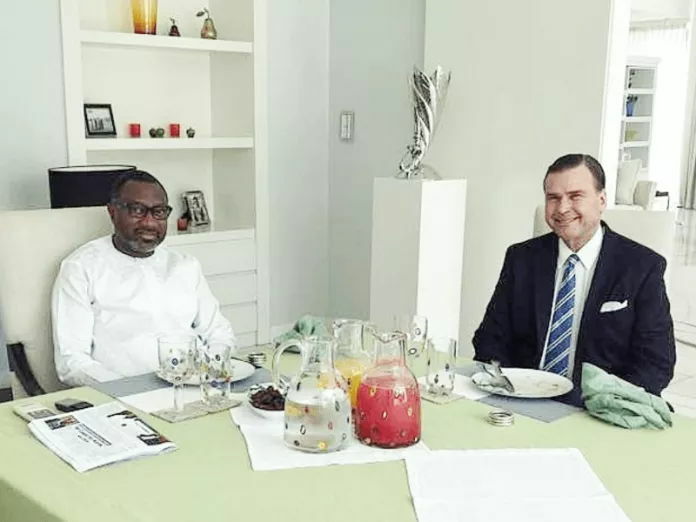 Also, Otedola hosted the British ambassador Arkwright to dinner at his residence recently, where talks centred on improving business ties between local businesses and British firms. Like his U.S. counterpart, Arkwright congratulated Otedola for his investment drive in the country, saying businesses such as Forte Oil had become beacons for others to follow. He assured Otedola that given the strong historic ties between Britain and Nigeria, the country remained an investment magnet for UK companies seeking to do business on the African continent. He charged Otedola to collaborate with other Nigerian entrepreneurs and businesses to encourage the federal government on creating a conducive environment for foreign and local businesses to thrive. Otedola, in his response, assured the British envoy that the Nigeria government has a policy in place and a council co-led by the private sector on the ease of doing business. "As you know, Nigeria recently improved its ranking on the World Bank's ease of doing business index by moving up 24 places. But the federal government is not resting on its oars because it wants to improve on the current ranking. "We in the private sector continue to meet with government ministries and agencies and collaborate with them in areas where more improvement is needed so that we can attract more foreign direct investment into the country. "And I am sure that with the support of the UK government and businesses in some of these areas, we will continue to see improvements in all sectors of the economy," Otedola said. He thanked Arkwright for the visit and expressed his commitment to working with British businesses on exploring new ventures in Nigeria.